Recently, I’ve written about a new group called Sweet Bitters (here’s their MySpace page). That story ended up being more focused on the place (Pete’s Candy Store) and their customer service, but ultimately, it was about discovering Sweet Bitters through my love of Girlyman. Given the experience communicating with Pete’s, the only reason to go there was to catch Sweet Bitters, but that was motivation enough. Not knowing anything about the neighborhood, we decided to drive. We got there reasonably quickly, even with a little more traffic than expected. We walked into Pete’s at 8:04pm, the show was scheduled to start at 9pm. One of the reasons to show up early was the complete lack of guidance from Pete’s. They did nothing to even describe the size of the room, etc. Walking in the front door answered all of our questions. Pete’s is a neighborhood bar. You could see that on the other side of the room, there was a hallway that led to the room where the music would be, but you couldn’t tell how big it was. When we walked in to that room, it was empty. Very small room, skinny, and a little long. Roughly 24 chairs, with room for another dozen or so standing if everyone was willing to be cozy. Definitely the smallest place we’ve ever seen music in. It was empty. Again, nice job on Pete’s part, considering that unless a local star is playing there, I doubt it ever fills up more than hour before the show. That’s all they needed to communicate. We took the first two seats near the stage and settled in. Five minutes later three people came in toting instruments. It wasn’t hard to guess that these were the Sweet Bitters ladies (Sharon Goldman and Nina Schmir) plus a helper. We chatted with them while they set up. Lovely women, and the helper is Nina’s boyfriend Craig (my assumption, but I’ll do a triple-take if I’m wrong) 😉 is a great guy as well. While they were unpacking we saw that they had CDs for sale. This is a sampler CD with four songs on it, the same four songs available on their MySpace page. Since I know I like all four of those songs already, I bought a CD (yes, signed by both of them) in advance, so that I wouldn’t be wasting their time after the show when hopefully others would be lining up to buy the CD. Craig and I went to the bar and brought back libations for ourselves and the ladies (Sharon and Nina stuck to water before the show). Shortly thereafter, still early, a few more people wandered in. By 9pm the room was nearly full. Let’s call it roughly 20 people there for the show. Sweet Bitters did 10 songs (so clearly, they have more material than just the sampler CD, good!). Both Sharon and Nina are songwriters, and of the 10 songs, five were written by each of them. 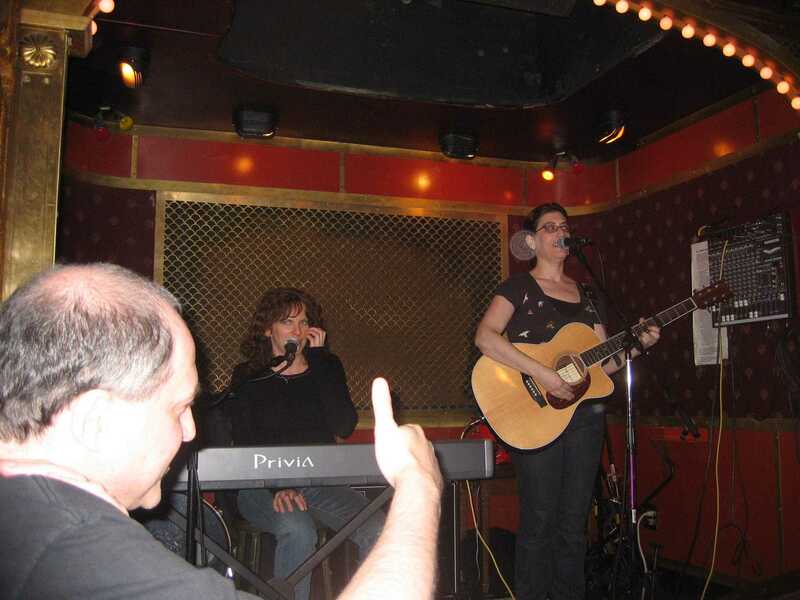 Sharon plays guitar (as can be seen in the photo above) and Nina plays the electric piano/organ (also seen above), but on a number of the songs, she also plays the guitar. Both are talented musicians. Both have lovely voices, and their harmonies are rich, interesting and anything but vanilla. When they declared the show over, we all wanted them to play more. They hesitated, because the artist scheduled to be on next (Alice Lee) was in the audience and ready to go on. Alice signaled to them to play another song. Very generous of Alice, and we all appreciated it greatly! They sang one more song, which was also excellent. As much as I would really have liked to hang around and listen to Alice Lee, both Lois and I were thoroughly exhausted. In addition, our garage closes for the night at midnight, so we had a secondary excuse. We waved goodbye to Sharon and Nina and headed home. A completely fun and satisfying evening, with the extra special gift of getting to chat with them for quite a while, in a relaxed atmosphere, before enjoying their lovely music. On a potentially (hopefully) serendipitous note, Craig works for a software company that might have a product that we could (eventually) use at Zope. If that ends up working out, this evening could turn into a business success rather than just a pleasure success. We’ll see, as we’ll be following up with Craig this week. We also got to meet Sharon’s fiance, a very nice guy. Unfortunately, he wasn’t there early enough for us to spend quality time with him, so other than being a really sweet guy, we know nothing about him. While I’d do it anyway, and you all know that by now, tying in Girlyman into this post is natural, since I only discovered Sweet Bitters through Girlyman alerts. With that, let’s do our regular dance this month, which is promoting the month-long Girlyman Live CD Contest going on now, in a browser near you!